Here is a list of cereals which may have been produced by Quaker Oats. We know that advertising work was done by Jay Ward Studios, but we cannot confirm the existence of an actual product. Please e-mail me at Topher if you have any information on any of these cereals. Thank you. Mr. E. "The Mysterial Cereal"
Hi-Lo's (with Officer Hi and Officer Lo). The ad featured the vocal talents of Jesse White as Officer Hi, Paul Frees as Officer Lo, and Bill Scott as the dreaded Hi Lo Munchster. Cereal bits may have been barrel-shaped. Here is a description of a character to which we are trying to confirm his name and cereal. Please e-mail me at Topher if you have any information on this character. Thank you. Character resembles an anteater or aardvark wearing a red bowler hat, a suitcoat and a red necktie. May have gone by the name Norbert. Here is a description of a cereal. We have yet to find any proof that it existed. If you have a cereal box image, or video, or any more definitive information, please e-mail me. Thank you. Cereal: Pink puffy little balls (corn-pop shaped). The cereal tasted like a bowl full of Captain Crunch Crunch Berries. Characters: Gummi Bears. 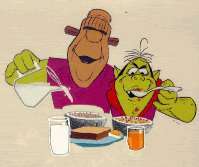 The cereal was based upon the large gang of cartoon characters that apperared on a breakfast cereal in the late 1980s and/or possibly the early 1990s. These characters were bears with blue fur that stood on their hind legs and wore clothing. The blue bear's name is "Tummi Gummi". Character: two monsters which look a lot like Dracula and Frankenstein, may be a single two-headed monster. Year of issue: Early 1970's. Suggestion #1: When no one was looking, these monsters would come out from a kitchen closet and take the cereal. Later they would come out when nobody was around and eat it at the kitchen table. Suggestion #2: These were a part of Post Pebbles cereal commercial. They were the prehistoric versions of Frankenstein and Dracula (probably Frankenstone and Slagula?). Suggestion #3: The characters in the cereal ad were joined together by a mad scientist possibly named Frankengoul. It ran in the mid west in the early 70's. If you know more about this cereal, please e-mail me. Thanks! Disclaimer: This is a non-commercial site with the sole purpose of assisting visitors in locating information on their favorite breakfast cereal characters. All of the names, characters, brands, and icons listed here are trademarks of their respective parent companies and cannot be used for commercial purposes. Enjoy your favorite cereal and support your favorite characters!